عشائری, سمیرا, سهرابی, تیمور, منتظر, علی‌اصغر. (1395). اثر مدیریت‌های مختلف پوشش بقایای گیاهی در برآورد تبخیر-تعرق واقعی با استفاده از مدل گیاهی SIMDualKc. نشریه آبیاری و زهکشی ایران, 10(6), 742-754. سمیرا عشائری; تیمور سهرابی; علی‌اصغر منتظر. "اثر مدیریت‌های مختلف پوشش بقایای گیاهی در برآورد تبخیر-تعرق واقعی با استفاده از مدل گیاهی SIMDualKc". نشریه آبیاری و زهکشی ایران, 10, 6, 1395, 742-754. عشائری, سمیرا, سهرابی, تیمور, منتظر, علی‌اصغر. (1395). 'اثر مدیریت‌های مختلف پوشش بقایای گیاهی در برآورد تبخیر-تعرق واقعی با استفاده از مدل گیاهی SIMDualKc', نشریه آبیاری و زهکشی ایران, 10(6), pp. 742-754. عشائری, سمیرا, سهرابی, تیمور, منتظر, علی‌اصغر. اثر مدیریت‌های مختلف پوشش بقایای گیاهی در برآورد تبخیر-تعرق واقعی با استفاده از مدل گیاهی SIMDualKc. نشریه آبیاری و زهکشی ایران, 1395; 10(6): 742-754. 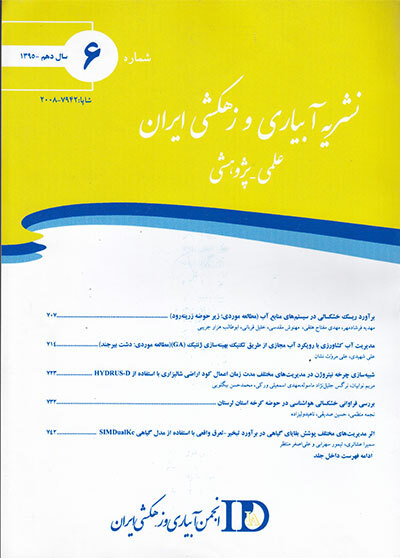 این تحقیق با هدف ارزیابی مدل آبیاری SIMDualKc و شبیه­سازی سناریوهای مختلف مدیریت بقایای گیاهی انجام شد. مدل مذکور تبخیر-تعرق را با روش ضریب گیاهی دو جزیی برآورد می­نماید، بنابراین امکان بررسی اثر انواع مالچ­ها (خاک پوش­ها) بر میزان تبخیر­-­تعرق را فراهم می­آورد. شبیه­سازی پنج سناریوی مدیریت پوشش بقایای گیاهی (مالچ آلی با چگالی­های به ترتیب 6/0، 5/0، 4/0، 3/0 و 2/0 کیلوگرم بر مترمربع) طی فصل رشد 81-1380 با استفاده از مدل گیاهی SIMDualKc صورت پذیرفت. واسنجی و صحت­سنجی مدل با استفاده از نتایج آزمایش مزرعه­ای تحت کشت گندم طی دو فصل زراعی متوالی 82-1380 انجام شد. اطلاعات اقلیم، خاک و گیاه و مدیریت آبیاری به مدل وارد گردید. مدل، آب قابل دسترس خاک را با مقدار راندمان مدل­سازی (EF) برابر 902/0، RMSE محاسبه شده 34/1 میلی­متر، میانگین خطای مطلق 995/0 میلی­متر و میانگین خطای نسبی برابر 67/4 درصد برآورد نمود. در مواردی که اطلاعات لازم برای واسنجی در دسترس نباشد استفاده از نتایج شبیه­سازی مدل با پارامتر­های گیاهی و نیز پارامترهای لایه تبخیری خاک استاندارد FAO-56، با دقت مناسبی قابل قبول است. نتایج شبیه­سازی در سناریوهای مختلف پوشش بقایای گیاهی نشان داد با افزایش چگالی مواد آلی پوششی، نسبت تبخیر به تبخیر-تعرق کم­تر می­شود و میزان تعرق گیاه افزایش می­یابد. بدون پوشش بقایای گیاهی مناسب نسبت تبخیر به تبخیر-تعرق 18 درصد بود که با کاربرد پوشش بقایای گیاهی (مالچ­های آلی) با چگالی 6/0 گیلوگرم بر مترمربع این نسبت به 8 درصد کاهش می­یابد. The objective of this study was to evaluate SIMDualKc crop model and then simulating different scenarios of surface residue cover. This model estimates evapotranspiration with dual crop coefficient approach. Therefore, that enables investigation of various mulch effects on evapotranspiration amount. Five management scenarios (organic mulch with densities of 0.2, 0.3, 0.4, 0.5 and 0.6) were simulated with SIMDualKc crop model during the 2001 and 2002 growing seasons. SIMDualKc model calibration and validation was performed with the results of 2 years data obtained from wheat field experiments located in Aboreihan University College of Tehran University. Then, climate, soil, crop and irrigation management data were inserted into model. The model estimated soil available water with model efficiency (EF) of 0.902 and calculating the following evaluation criteria: RMSE=1.34 mm, absolute error = 0.955 mm and mean relative error = 4.67 %.with lack of required data for calibration, using FAO-56 standard crop and soil evaporative parameters resulted in reasonable accuracy. Various scenarios of crop residue mulch simulation results showed that with increase of organic mulch density, the ratio of evaporation to evapotranspiration (E/ET) decreased and transpiration rate increased. While ratio of E/ET was 18% w/o crop residue mulch, by applying organic mulch with density of 0.6 Kg/m2 decreased to 8%. علیزاده،ا. 1390. اصول هیدرولوژی کاربردی. چاپ سی و یکم، انتشارات آستان قدس رضوی: 432. مجنونی هریس،ا.، زندپارسا، ش.، سپاسخواه،ع و کامگار حقیقی،ع. ۱۳۸۶. ارزیابی مدل MSM جهت پیش‌بینی تبخیر-‌­تعرق ذرت دانه‌ای و مقایسه نتایج آن با مقادیر حاصله از روش‌های پیشنهادی فائو ۵۶ . مجله علوم آب و خاک. 11 . 41: 42-29. Adams,J.E. 1966. Influence of mulches on runoff, erosion, and soil moisture depletion. Soil Science Society of America Journal. 30: 110–114. Allen,R.G. 2000. Using the FAO-56 dual crop coefficient method over an irrigated region as part of an evapotranspiration intercomparison study. Journal of Hydrology. 229: 27–41. Allen,R.G., Pereira,L.S., Raes,D., Smith,M. 1998. Crop Evapotranspiration. Guidelines for Computing Crop Water Requirements. FAO Irrigation and Drainage Paper 56, FAO, Rome, Italy, 300p. Allen,R.G., Pereira,L.S., Smith,M., Raes,D., Wright,J.L. 2005. FAO-56 dual crop coefficient method for estimating evaporation from soil and application extensions. Journal of Irrigation and Drainage Engineering. 131: 2–13. Amatya,D.M., Skaggs,R.W., Gregory,J.D. 1995. Comparison of methods for estimating reference ET. Journal of Irrigation and Drainage Engineering. 121: 427–435. Bond,J.J., Willis,W.O. 1970. Soil water evaporation: first stage drying as influenced by surface residue and evaporation potential. Soil Science Society of America Journal. 34: 110–114. Cancela,J.J., Fandino,M., Rey,B.J., Martinez,E.M. 2015. Automatic irrigation system based on dual crop coefficient, soil and plant water status for Vitis vinifera ( Godello and cv Mencia). Agricultural Water Management. 151: 52–63. Choudhury,B.J., Monteith,J.L. 1988. A four-layer model for the heat budget of homogeneous land surfaces. Quarterly Journal of Royal Meteorological Society. 114: 373–398. FAO-56. 1998. Crop evapotranspiration: Guidelines for computing crop water requirements. Irrigation and Drainage Paper No. 56. Food and Agriculture Organization of the United Nations, Rome, Italy. Flury, M., Mathison, J.B., Wu, J.Q., Schillinger, W.F., Stockle, C.O., 2009. Water vapor diffusion through wheat straw residue. Soil Science Society of America Journal. 73, 37–45. Gardiol,J.M., Serio,L.A., Maggiora,A.I.D. 2003. Modelling evapotranspiration of corn (Zea mays) under different plant densities. Journal of Hydrology. 271, 188–196. Guan,H., Wilson,J.L. 2009. A hybrid dual source model for potential evapotranspiration partitioning. J. Hydrol. 377, 405–416. Hammel, J.E., 1996. Water conservation practices for sustainable dryland farming systems in the Pacific Northwest. American Journal of Alternative Agriculture. 11: 2–3. Hatfield,J.L. 1990. Methods of estimating evapotranspiration. In: Stewart,B.A., Nielsen,D.R. (Eds.). Irrigation of Agricultural Crops. Agronomy Monograph. 30. ASA, CSSA and SSSA, Madison, WI: 435–474. Heilman,J.L., McInnes,K.J., Gesch,R.W., Lascano,R.J. 1992. Evaporation from ridge-tilled soil covered with herbicide-killed winter wheat. Soil Science Society of America Journal. 56: 1278–1286. Irmak,S., Istanbulluoglu,E., Irmak,A., 2008. An evaluation of evapotranspiration model complexity against performance in comparison with Bowen ratio energy balance measurements. Transactions of the American Society And Biological Engineers. 51: 1295–1310. Jensen,M.E., Wright,J.L., Pratt,B.J. 1971. Estimating soil moisture depletion from climate, crop, and soil data. Transactions of the American Society And Biological Engineers 14: 954–959. Klocke,N.L., Currie,R.S., Aiken,R.M. 2009. Soil water evaporation and crop residues. Transactions of the American Society And Biological Engineers. 52: 103–110. Kustas,W.P., Norman,J.M. 1999. Evaluation of soil and vegetation heat flux prediction using a simple two-source model with radiometric temperatures for partial canopy cover. Agricultural and Forest Meteorology. 94: 13–29. Lagos,L.O., Martin,D.L., Verma,S.B., Suyker,A., Irmak,S. 2009. Surface energy balance model of transpiration from variable canopy cover and evaporation from residue-covered or bare-soil systems. Irrigation science. 28: 51–64. Liu, Y., Pereira, L.S., 2000. Validation of FAO methods for estimating crop coefficients. Transactions of the Chinese Society of Agricultural Engineering. 16 (5), 26–30 (in Chinese). Lopez-Urrea,R., Olalla,F.M., Fabeiro,C., Moratalla,A. 2006. An evaluation of two hourly reference evapotranspiration equations for semiarid conditions. Agricultural Water Management. 86.3: 277–282. Montazar,A.A., mohseni,M. 2011. Influence of Supplemental Irrigation and Applied Nitrogen on Wheat Water Productivity and Yields. Journal of Agricultural Science. 3: 78-90. Monteith,J.L. 1965. Evaporation and the environment. Proceedings Symposium of the Society for Experimental Biology. 19: 205–234. Moody,J.E., Jones Jr.,J.N., Lillard,J.H. 1963. Influence of straw mulch on soil moisture, soil temperature, and the growth of corn. Soil Science Society of America Journal.. 27: 700–703. Norman,J.M., Kustas,W.P., Humes,K.S. 1995. A two-source approach for estimating soil and vegetation energy fluxes from observations of directional radiometric surface temperature. Agricultural and Forest Meteorology. 77: 263–293. Odhiambo,L.O., Irmak,s. 2012. Evaluation of the impact of surface residue cover on single and dual crop coefficient for estimating soybean actual evapotranspiration. Agricultural Water Management. 104: 221– 234. Paço,T.A., Pôças,I., Cunha,M., Silvestre,J.C., Santos,F.L., Paredes,P., Pereira,L.S. 2014. Evapotranspiration and crop coefficients for a super intensive olive orchard. An application of SIMDualKc and METRIC models using ground and satellite observations. Journal of Hydrology. 519: 2067–2080. Pansu,M., Gautheyrou,J. 2006. Handbook of Soil Analysis. Springer Berlin Heidelberg New York. Paredes,P., Rodrigues,C.C., Alves,I., Pereira,L.S. 2014. Partitioning evapotranspiration, yield prediction and economic returns of maize under various irrigation management strategies. Agricultural Water Management. 135: 27– 39. Qiu,R., Du,T., Kang,S., Chen,R., Wu,L. 2015. Assessing the SIMDualKc model for estimating evapotranspiration of hot pepper grown in a solar greenhouse in Northwest China. Agricultural Systems. 138: 1–9. Ren,D., Xu,X., Hao,Y., Huang,G. 2015. Modeling and assessing field irrigation water use in a canal system of Hetao, upper Yellow River basin: Application to maize, sunflower and watermelon. Journal of Hydrology. 532: 122–139. Rockström,J and de Rouw,A.R. 1997. Water, nutrients and slope water, nutrients and slope position in on-farm pearl millet cultivation in the Sahel. Plant Soil. 195:311–327. Rosa,R.D., Paredes,P., Rodrigues,G.C., Alves,I., Fernando,R.M., Pereira,L.S., Allen,R.G. 2012b. Implementing the dual crop coefficient approach in interactive software. 1. Background and computational strategy. Agricultural Water Management. 103: 8– 24. Rosa,R.D., Paredes,P., Rodrigues,G.C., Fernando,R.M., Alves,I., Pereira,L.S., Allen,R.G. 2012a. Implementing the dual crop coefficient approach in interactive software. 2. Model testing. Agricultural Water Management. 103: 62–77. Russel,J.C. 1939. The effect of surface cover on soil moisture losses by evaporation. Proceedings. Soil Science Society of America. 4: 65–70. Shengwei,Z., Rui,S., Hongbin,Z., Tingxi,L., Hongbo,S., Zichang,Z. 2015. Correlating between evapotranspiration and precipitation provides insights into Xilingol grassland eco-engineering at larger scale. Ecological Engineering. 84: 100–103. ShiZhang,P., JiaLi,D., Zhi,M., JunZheng,X., DaoXi,L. 2007. Estimation and verification of crop coefficient for water saving irrigation of late rice using the FAO-56 method. Transactions from the Chinese Society of Agricultural Engineering. 23.7: 30–34. Shuttleworth,W.J., Gurney,R. 1990. The theoretical relationship between foliage temperature and canopy resistance in sparse crops. Quarterly Journal of Royal Meteorological Society. 116: 497–519. Shuttleworth,W.J., Wallace,J.S. 1985. Evaporation from sparse crops–an energy combination theory. Quarterly Journal of Royal Meteorological Society. 111: 839–855. Steiner,J.N. 1989. Tillage and surface residue effects on evaporation from soils. Soil Soil Science Society of America Journal. 53.4: 911–916. Stockle,C.O., Nelson,R. 1999. ClimGen, A Weather Generator Program. Biological Systems Engineering Department Washington State University, Pullman, WA. Stockle,C.O., Nelson,R., Donatelli,M., Castellvi,F. 2001. ClimGen: a flexible weather generation program. In: Proceedings of the Second International Symposium on Modelling Cropping Systems, July 16–18, 2001, Florence, Italy, pp. 229–230. Temesgen,B., Eching,S., Davidoff,B., Frame,K. 2005. Comparison of some reference evapotranspiration equations for California. Journal of irrigation and Drainage Engineering. 131.1: 73–84. Todd,R.W., Klocke,N.L., Hergert,G.W., Parkhurst,A.M. 1991. Evaporation from soil influenced by crop shading, crop residue, and wetting regime. Transactions of the American society of agricultural and biological engineers.34.2: 461–466. Tolk,J.A., Howell,T.A. 2001. Measured and simulated evapotranspiration of grain sorghum grown with full and limited irrigation in three high plains soils. Transactions of the American society of agricultural and biological engineers. 44.6: 1553–1558. Unger,P.W., Parker,J.J. 1976. Evaporation reduction from soil with wheat, sorghum, and cotton residues. Soil Science Society of America Journal. 40 .6: 938–942. Van Wijk,W.R., Vries,D.A. 1954. Evapotranspiration. Netherlands Journal of Agricultural science. 2: 105–119. Ventura,F., Spano,D., Duce,P., Snyder,R.L. 1999. An evaluation of common evapotranspiration equations. Irrigation Science. 18: 163–170. Wilcox,LV., 1948. The quality of water for irrigation use. US Department of Agriculture Technology Bulletin 49: 962. Wright,J.L. 1981. Crop coefficients for estimates of daily crop evapoevapotranspiration. In: Irrigation Scheduling for Water and conservation in the 80s. Proceedings, irrigation scheduling conference, Chicago, Illinois, Dec. 14-15, 1981. ASAE publication 23-31, American Society of Agricultural Engineers, 1981. 231 pp. Wright,J.L., 1982. New evapotranspiration crop coefficients. Journal of the Irrigation and Drainage Engineering. 108.1: 57–74. Wright,J.L., Jensen,M.E. 1978. Development and evaluation of evapotranspiration models for irrigation scheduling. Transactions of the American society of agricultural and biological engineers. 21.1: 88–96. Yoder,R.E., Odhiambo,L.O., Wright,W.C. 2005. Evaluation of methods for estimating daily reference crop evapotranspiration at a site in the humid southeast of USA. Applied Engineering in Agriculture. 21.2: 197–202. Zhao,C., Nan,Z. 2007. Estimating water needs of maize (Zea mays L.) using the dual crop coefficient method in the arid region of northwestern China. African Journal of Agricultural Research. 2.7: 325–333. Zhao,N., Liu,Y., Cai,J., Paredes,P., Rosa,R.D., Pereira,L.S. 2013. Dual crop coefficient modelling applied to the winter wheat–summer maize crop sequence in North China Plain: Basal crop coefficients and soil evaporation component. Agricultural Water Management. 117: 93– 105.